The ultimate secret weapon in the fight for leisure time. 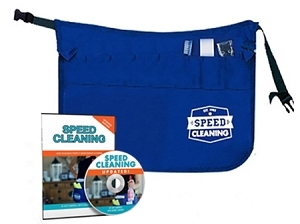 Speed Cleaning Apron comes with four replaceable plastic pocket liners (enough to last a year or more) plus clips. 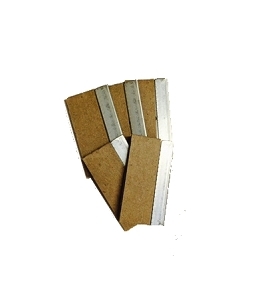 Most of us wouldn't even hire a carpenter who didn't wear a carpenter's belt and had to climb up and down a ladder every time he or she needed a nail. Yet that's exactly how many of us go about cleaning our homes. Time is wasted and people are worn to a frazzle making aggravating trips back and forth and up and down when they ought to be finished and well into a good book, on the 3rd green, or picnicking with the kids. 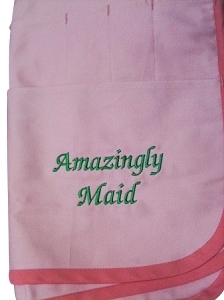 Our exclusive Cleaning Apron is the first and most important secret to getting housecleaning over with quickly. Specialized pockets and loops mean everything you need is right there with you. You clean your way around the room once and YOU'RE DONE! Clean from top to bottom, back to front, and clockwise around the room, doing the dusting, wiping, and polishing as you go. No wasted time. No wasted energy. No backtracking. No fooling. Plastic buckles snap together and stay put. Nothing to tie or to adjust. Strong, light, and comfortable 100% cotton duck fabric is easy to launder and looks great after many launderings. Double and triple stitched for strength. 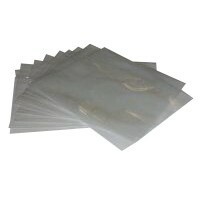 It comes with four replaceable plastic pocket liners (enough to last a year or more) plus clips. I ordered a pink apron to keep my tools in. Once you use the apron you won't go back! I suggest two aprons per cleaner. One for bathroom tools and one for the rest. Color coded makes it impossible to confuse. I didn't add my logo but next time I order one I will. They hold up very well to washings weekly! Love the apron! Would give it 5 stars if there was a waterproof liner sewn into the front two pockets. 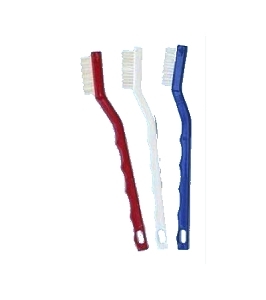 The plastic bas and clips move around and slide out, slowing the cleaning process down. Overall though, GREAT APRON to truly speed up cleaning without losing the quality of the clean.